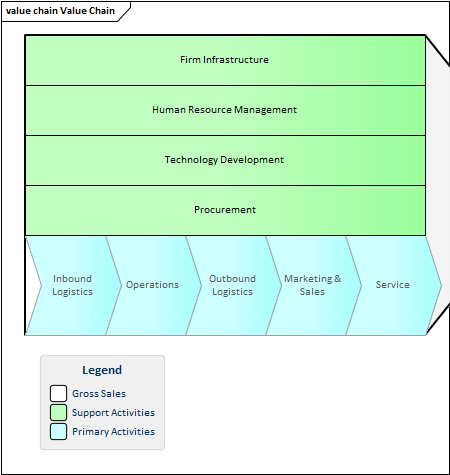 The Value Chain is a strategic diagram that allows the primary and secondary activities in an organization to be modeled. The diagram can be created from a Pattern that adds and connects the five primary activities in a chain and the four supporting activities underpinning them. An analyst working at the strategic business unit level will often be asked to model the activities the business unit performs to provide value to its customers. The Value Chain is the preferred tool for creating this strategic representation of the sequence of activities that an organization performs. The Value Chain is an important tool to assist with strategic planning allowing the whole sequence (or chain) to be understood. It also allows the chain to be broken down into its constituent activities allowing the evaluation of costs, resource and value to be determined and potentially improved. Each one of the Primary and Supporting Activities can be linked to other elements in the model including a linked document and elements that define benchmarks. 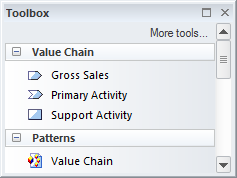 The Value Chain Diagram (like any diagram) can be viewed as an element list which makes working with the element's properties easier. Diagram Filters can also be used when presenting the diagrams to draw attention to parts of the diagrams.